The Alhambra City Jail is a small holding facility used primarily for those who have been recently arrested. 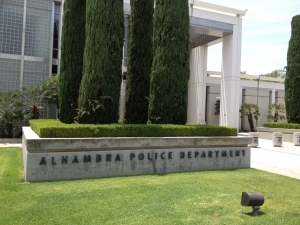 When the Alhambra City Jail gets overcrowded, or an inmate has been arraigned in court, males are typically transferred to Twin Towers Correctional Facility and females are taken to the Lynwood Jail. When an individual is arrested, they are taken to a police station for booking and processing. This is the procedure in which the police take fingerprints and photographs of the arrestee and conduct a background check. After all of this is complete, bail is set for those who are eligible. When no bail is posted either immediately (or shortly) after someone is finished with booking and processing, they will often end up being transferred to one of the larger jail facilities in the area. This will lengthen the amount of time spent in custody significantly because they will need to go through booking and processing again at the larger facility. If you want to get your friend or loved one out of custody fast, going through a licensed, professional bail bondsman is much faster than trying to post bail at the jail yourself. The entire bail application process can be handled at our office, your home, or anywhere you happen to be, provided you can be reached via fax or email. Most of our clients prefer to pay the cost of a bail bond by credit card, since it’s the easiest. We accept major credit/debit cards including: American Express, Discover, Visa, and Master Card. However, we also accept other payment options including cash, check, money order, bank account transfer and money wire. If a friend or loved one is in custody at the Alhambra City Jail and you want to get them out, we can help. Call and speak with a licensed, professional bail bondsman today who will guide you through the bail bond application process step by step. We are available 24/7 at: 855-414-BAIL (2245).